My health has been pretty dismal lately and any physical activity at all gets me ridiculously exhausted to the point that I have to lay in bed to recover for a couple hours, or sometimes days… Not fun at all. Some days, just walking to the kitchen to make myself a sandwich is enough to trigger it, but other days it’s not as bad. So I haven’t left the house very much the past couple weeks, and when I do, it’s usually not very far – a couple blocks at the most. Sometimes you just need to "get out" though, but unfortunately there isn’t a lot of great food to be had close to home (on Danforth, between Woodbine and Main). I’ve passed by Sandy’s Restaurant (on the southeast corner of Woodbine and Danforth) countless times and from the outside, it doesn’t look like a very nice place to eat. Maybe I’m starting to get a little desensitized to this area, or maybe I’m just starting to get a little more open-minded, but whatever it is, I finally decided to give Sandy’s a try last week, and I’ve been back two more times since then. Yes, I love Chinese food, but not the watered-down North-Americanized Chinese food that you’d find in a food court at a mall (like sweet and sour balls, spring rolls, ginger beef, brown soy sauce fried rice, etc. ), but the real deal authentic Chinese food. (it’s not at all the same thing…) it’s pretty hard to find sometimes and then even when you do, you still have to know what to order. Just like East Side Mario’s isn’t really Italian food, or how Taco Bell isn’t really Mexican food… but sometimes you’re in the mood for a Mexican Fries Supreme , or sweet and sour chicken balls anyways. On my first visit to Sandy’s I ordered #106 – "Shanghai Noodles" Daily Special ($6.99), which comes with a coffee, tea, or orange juice. I was expecting something similar to what you’d find in a food court and my expectations weren’t far off from what I was served, but for what it’s worth, I’d say it was slightly better than what you’d find in a food court. Real shrimp, BBQ pork and no cabbage as filler. There were bean sprouts in it though, but just enough that made it a pleasant addition rather than a filler. My first visit brought back memories of Wok n’ Roll Bistro in Calgary, but probably because it’s been a while since I’ve had North-Americanized Chinese food that wasn’t trying to pretend it was anything else. Either way, it was good enough to pique my curiosity and want to return to try their "Canadian" dishes. On my next visit to Sandy’s, I ordered the Chicken Fingers with French Fries and Coleslaw ($6.99), and a glass of Orange Juice ($1.50). The chicken fingers were moist and tender, but not what you normally expect with chicken fingers – I was expecting more of a crunchy breaded texture, but they were very soft and seemed almost battered. It was also a little odd to have so many pepper specks in the flour mixture, but I like pepper so it was all good. The only plum sauce they have comes in packets (Wing’s) and it was a little annoying to have to squeeze it out onto my plate to dip the chicken fingers. I suppose I could have asked for a ramekin to squeeze out a bunch of packets and make it easier, (and I probably should have), but I didn’t. The fries were also very good (likely frozen and out of a bag though), but their coleslaw definitely wins the prize for the worst coleslaw ever. Actually, you can’t really call that coleslaw. It was just soggy sweet pickles with pickled carrots and julienned lettuce (not cabbage) on a bed of iceberg lettuce. Super sour to the point of being inedible and the farthest thing from coleslaw I’ve ever seen. Good thing the portion of chicken fingers and fries was big enough that I didn’t need the coleslaw anyways. On my third visit to Sandy’s I went with Michelle and she ordered the chicken fingers and fries – she liked the fries but found the chicken fingers "bland" and agreed that the coleslaw was an inedible disaster. I was still curious about their Chinese dishes, so I ordered a Wonton Soup ($2.99), Spring Roll ($1.50) and Cantonese Chow Mein ($9.75). Yes, that’s a lot of food! I was pleasantly surprised to find little strips of BBQ pork at the bottom of my wonton soup but the wontons themselves were very weak, like what you’d get at a cheap all-you-can-eat Chinese buffet. They had too much water chestnuts, no shrimp, a grainy texture and definitely weren’t packed with flavor – in fact, there are some really good frozen wontons (made in Richmond Hill or Markham?) that you can buy at the Sobey’s by our house that are infinitely better. Their broth, on the other hand, was very delicious and I drank it all up, which I don’t normally do, anywhere. The spring roll was… a typical spring roll. Just very big and thick – apart from the size, there was nothing very memorable about it. Good though. The Chow Mein was a lot bigger than I expected and I was pleasantly surprised to see that the egg noodles were cooked perfectly – there was a perfect balance between soft, saucy noodles in the middle of the plate with very crunchy and crispy (but not burned) noodles on the edges – just how it should be. it’s too bad that the vegetables were soggy and very overcooked though, otherwise it would have been a lot better. Again, I’m not about to recommend jumping on the subway and going out of your way to visit Sandy’s Restaurant, but it’s a decent option if you’re in the area. Sandy’s Restaurant accepts cash only, but there is a Scotiabank, TD Canada Trust and Royal Bank on the corner of Woodbine and Danforth. Still, these days who carries cash anymore? Even if I had to pay $1 extra in Interac/terminal fees every single time, I would prefer it over "cash only" – wouldn’t you? 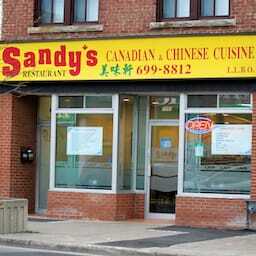 Sandy’s Restaurant was published on Thursday, November 24, 2011 at 1:45pm EST by Daniel Menjívar and last updated on April 11, 2018 at 9:30pm UTC .